American consumers have been telling restaurants for decades that they want to see more healthful options on menus, but historically they have rarely purchased better-for-you dishes. That long-term trend has been shifting slowly, and consumers are beginning to place greater importance on their eating habits. Part of the change has to do with the way consumers define “healthy.” While there are any number of ways to describe healthful options, many consumers have shifted their definition from “low fat” and “low calorie” to “fresh” and “locally grown.” Vegetables have benefited from this evolution, as both consumers and menu developers alike have discovered creative uses beyond salads and side dishes—though those have certainly grown more creative as well. This piece will examine the consumer trends driving vegetables’ growth on menus before quantifying the increases in menu incidence and providing current examples. U.K. operators and their suppliers can use the findings and restaurant examples as they develop their own new products. 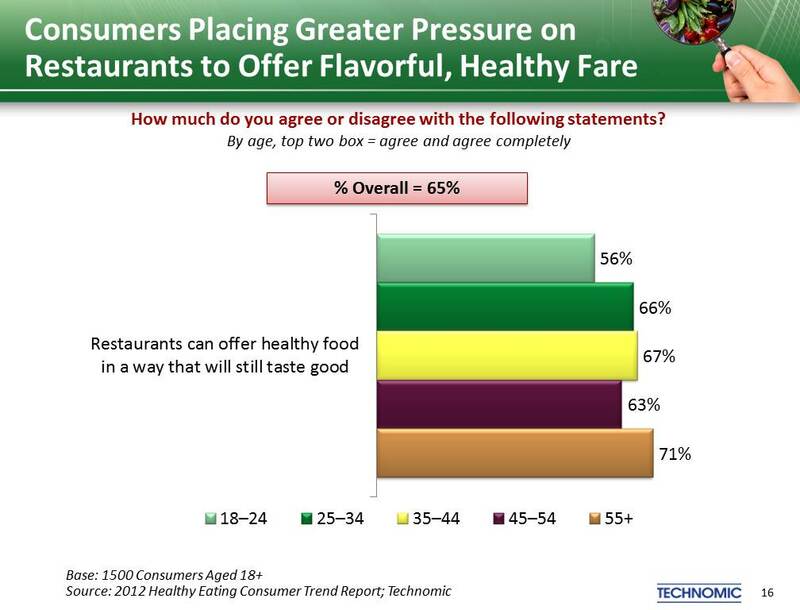 As mentioned above, consumers are placing greater pressure on restaurants to offer flavorful, healthy fare. A majority of consumers, 65%, now agree that “restaurants can offer healthy food in a way that will still taste good,” according to Technomic’s recent “Category Close-Up: Vegetables” report. In fact, many restaurant-goers say they are more likely to visit an eatery that offers some healthy options, even if they don’t end up ordering a healthy choice. Almost two-fifths (38%) of consumers said as much, a figure that is up from 33% two years prior. More than nine out of 10 consumers agree that menu items containing a full serving of vegetables are more healthy. Interestingly, nearly half (48%) of consumers think that having a full serving of vegetables makes a dish more tasty, compared to only 8% that think vegetables make a dish less tasty. The rise in vegetarianism and, more so, flexitarianism has also played a role. Technomic found that two-thirds of consumers agree at least somewhat that vegetarian meals can be just as satisfying as meat-based meals. When we asked consumers what percentage of the meals they eat, both at home and away from home, include some type of meat, poultry or seafood and what percentage do not, we found that 18%, or nearly one out of five meals, do not contain meat. And even consumers who are not necessarily interested in healthy or meatless meals are likely to be interested in foods described as local, natural and organic. 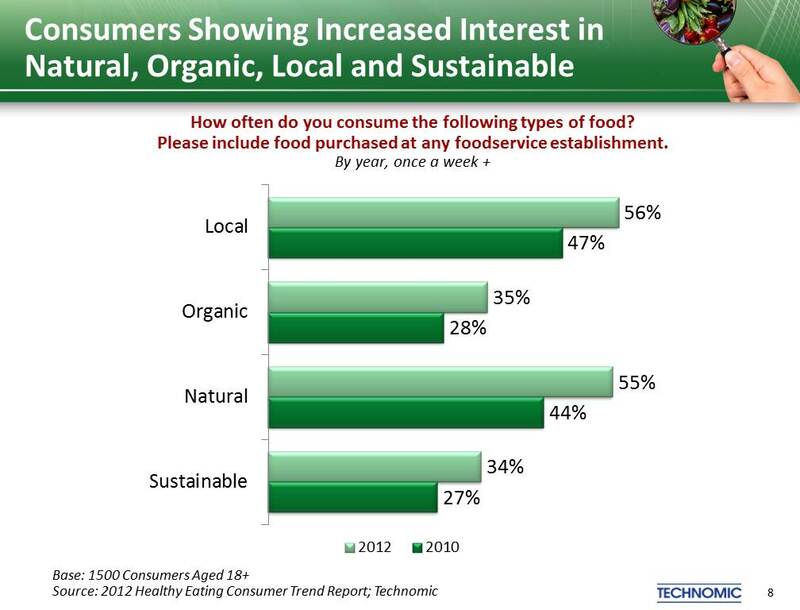 In a 2012 Technomic survey, 56% of consumers said they consume “local” foods at least once a week (a figure that is up from 47% who said the same two years prior). Fifty-five percent said they eat “natural” foods weekly (up from 44%), and 35% said the same of “organic” foods (up from 28%). These consumer demands have restaurant operators across the board adding vegetables to the menu in salads, sides, main dishes and appetizers. 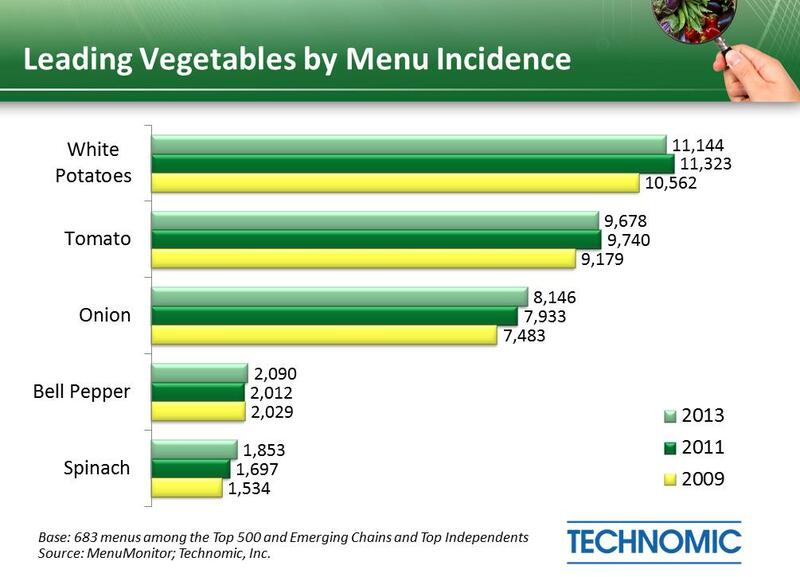 “Category Close-Up: Vegetables” used Technomic’s MenuMonitor online trend-tracking tool to analyze the menus of 683 of the top restaurant chains, emerging concepts and independent operators over five years. 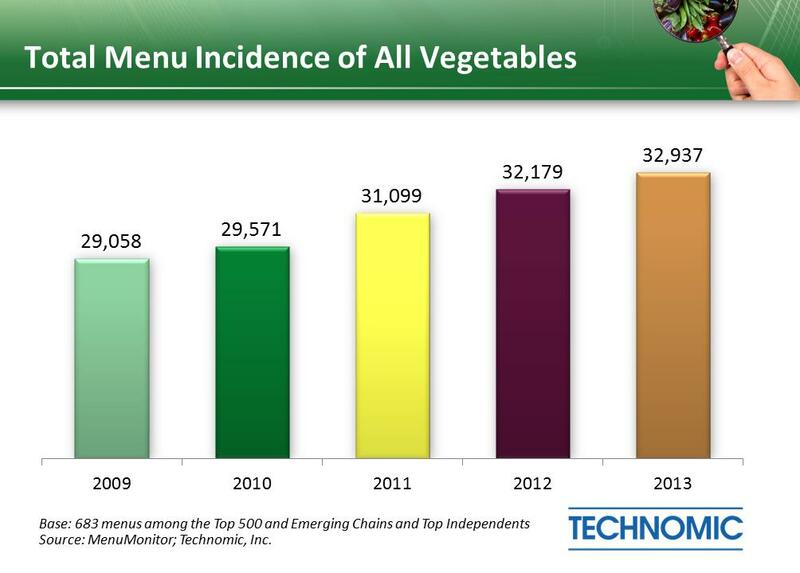 As the “Total Menu Incidence of All Vegetables” chart illustrates, incidence of all vegetables (including produce such as tomatoes and peppers, which are technically fruit but used by culinarians as vegetables) has increased by 13% since 2009. Year-over-year, the increase was 2.3%. What follows is a look at different categories of vegetables and some insights from the report. Root Vegetables: This category includes some of the most widely consumed vegetables—white potatoes, carrots and sweet potatoes—as well as the less-common beet. Within this group, sweet potatoes and beets have shown the most notable increases (each up more than 75% over the five-year period). Both of these vegetables have sweet flavor characteristics, a fact that operators can exploit by offering diners options that are at once sweet and healthy. For example, casual-dining chain Claim Jumper pairs sweet with spicy in its Jamaican Jerk Chicken Sweet Potato. Leafy Vegetables/Lettuces: While many of the vegetables in this category are used as a salad base, the most innovative restaurant operators have taken iceberg, cabbage, arugula, kale, spinach and Brussels sprouts past the salad realm and into center-of-the-plate options. The darling of the category is kale. While the total incidence of kale remains relatively low, it grew by almost 400% over the past five years. Operators have found a variety of uses for kale, ranging from salads to “chips” to a replacement for the more traditional sautéed spinach. For example, Rosa Mexicano Restaurants’ Salmon Con Salsa de Frutas is served with a Kale-Pancetta Ragu. Botanical Fruits, Culinary Vegetables: This category includes a number of ingredients commonly recognized as vegetables, although their botanical definition classifies them as fruits, such as avocado, bell pepper, eggplant, tomato, tomatillo and zucchini. Over the past five years, almost all of these vegetables have shown positive trends on menus (with the exception of eggplant). Many of these are commonly found in ethnic (primarily Latin-inspired) dishes. To wit, avocados and tomatillos have posted the largest five-year growth rates of the vegetables in this category. Other Vegetables: This category contains mainstream vegetables that do not fit neatly into the other categories, such as onions, asparagus and broccoli. Broccoli fared well on restaurant menus over the past five years, with gains of nearly 30% in incidence. Broccoli’s strong performance can partially be attributed to the interest in healthier kids’ meals, as 14% of all broccoli mentions are kid-centric. While kids’ menus deserve some focus, operators are also expanding the ways adults get their daily serving of vegetables. For instance, quick-service chain Golden Krust Caribbean Bakery’s Vegetable Patty packs broccoli with carrots and cabbage into a whole-wheat pastry (combining the whole-wheat, portable and ethnic trends into a single menu item). While many consumers will still consider restaurant visits a treat and a reason to indulge, many restaurant operators are building traffic by creating options that incorporate healthful elements in an innovative, appealing and even indulgent manner. In addition to imparting a “healthy” element, fresh vegetables allow operators to add vibrant flavors and colors, which both reinforces the freshness of the dish and makes it appear even more appealing. Darren Tristano is Senior Managing Director of Technomic Inc., a Chicago-based foodservice consultancy and research firm. Since 1993, he has led the development of Technomic’s Information Services division and directed multiple aspects of the firm’s operations. For more information, visit http://www.technomic.com. This entry was posted on Monday, December 9th, 2013 at 10:00 am and is filed under Uncategorized. You can follow any responses to this entry through the RSS 2.0 feed. You can leave a response, or trackback from your own site.